﻿ Wiltshire Rose > Books > Why England? hy England explores perhaps the richest, documented history of any nation in the world. The work focuses on events and documents, which moulded the English character and shaped the nation between the 6th and 16th centuries; it describes the emergence of a single, unified 'England' from a collection of disparate, Anglo-Saxon kingdoms. The book opens with an explosive description of the 'Black Death', which devastated England in 1348-9. Readers are advised that the pestilence killed approximately half of Europe's population. The disease is described as the worst catastrophe known to humankind and its effects are compared to nuclear explosions in 1945 and the modern-day tragedy of HIV/AIDS. The account finishes with an explanation of the consequences for ordinary people who had to lift England out of the terrible abyss. The second chapter concentrates on the remarkable experiences of a small, rural community at Eyam in Derbyshire. In the 17th century, the village suffered an attack of the bubonic plague but it survived after the residents took a courageous decision to place themselves in quarantine. Eyam is described as a living monument to the effects of the 'Black Death'. Two chapters are devoted to succinct descriptions of the 'Reformation' and the 'Dissolution of the Monasteries'. Together they describe the most significant social changes ever imposed on the English; they offer reasons for the country's dramatic change of direction in the 15th and 16th centuries. 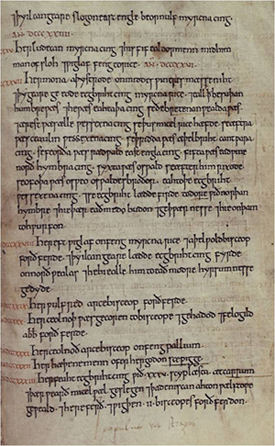 Bede's 'History' and the Anglo-Saxon Chronicle. These are among the oldest surviving written histories in the world; they date to the 8th and 9th centuries. Their provenance and importance has been described in detail. 'Beowulf' and Chaucer's Canterbury Tales are offered as superb examples of the development and sophistication of the English language between the 10th and 14th centuries. The Domesday Book is the world's oldest survey of citizens; it contains 13,400 English place names and its text is as clear as the day on which it was presented to William the Conqueror. The book explains how and why this most renowned ruler was inspired to gather such detailed information on his subjects. In the penultimate chapter, the text of the Magna Carta is described as the foundation of domestic and international freedoms; in that respect, it may be considered the most important document in world history. The conflicts and demands, which lay behind the creation of this amazing manuscript are dealt with at length. An explanation is offered as to why the Magna Carta is better understood and more revered in America than it is in its native England. The book finishes with a 'Calendar of English Dates'. The calendar contains nearly 400 entries and most readers will be able to match personal anniversaries with significant events from England's past, thus placing themselves alongside the towering figures and events of their English heritage.